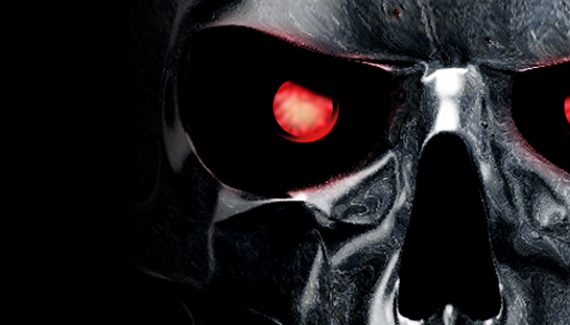 This tutorial shows how to take a stock image of a human skull into Photoshop and create a terminator robot. Amazing work, thank you Corey. You are a dude Mr. Barker. Once again you rocked it out. You give us something that is beyond any tutorial you will find anywhere else. You rock! Pretty cool. think you could do more Terminator tuts? I’d like to see how you would make it look like the skull was peering through flesh of a human, preferably from scratch (ie, by not using pics of wounds for the torn bloody skin). any time I try, the flesh along the edges of the torn skin never really look convincing. That’s the first time I leave a comment here but I always watch your tutorials. Great, great job as always! Where do u get that picture from? Hey. Great tutorial. I have been making my own terminator as one would do but what i have been doing is layering my face over the top of it and adding in gun wounds and other wounds to it. I am not so satisfied with the flesh torn effect and was wondering if u could do a tutorial using the terminator skull u have just made and put a face on it also adding wounds similar to end of terminator 2. Much appreciated. All the best. that was really great. Corey, you rocks! Nice Tut, you are the Man!! this is super amazing.. thanks corey! Oh wow! that was brilliant. Cheers! Please help!! Its never happened before. I tried using the filter liquify but I couldn’t see the live preview while making the changes, but when I clicked ok, It actually did make the changes. Question : How do I see the changes being made while using liquify, is it some setting that went wrong? please help me i’m a jonior and want to be a professional so help me as much as you can and i would thank mr.Corey Barker and please talk slowly because you speak sooooooo fast. Hello Baker, Please how do I download the terminator tutorial? can you make one half human and half terminator! hey i was wondering where you got your skull picture for this project from? Can u send us a link to the metallic skull and the texture? hey how can i blend in a picture of my face with this terminator face???? Many thanks for this information and facts. It is much appreciated! Best regards. wtf is ‘option key’ ? I’m not gonna lie: that’s badass. for just 1piso! (hehhee)… But serreusly its Great! nice one 🙂 Keep Up the GoodWork! Find your own pictures. Tutorials aren’t about following every single step to the dot. Challenge yourselves. Think outside the box. It takes zero skill to follow instructions, it just takes a brain…and we all have one. So, be unique and teach yourself something while learning something from a Professional. I have a question. This tutorial was interesting and good, but I courious for how can you do a realistic silver or metal skull from a human skull for example. In this video, You used a silver skull. But how can I do that? Thank you for your answere in advance.